The machine base is a sturdy Cast Iron base, which forms the machine table and is suitably supported by a sturdy steel angle frame. ¼ h.p. 1440 rpm single-phase 220 Volts AC-50 cycle motor to drive the grinding lap. One tiny DC motor to drive the work piece. A central housing that contains the main shaft driven by the main motor, the r.p.m. of which can be adjusted with the help of step pulleys provided. The main facetor of the machine is mounted on a bearing pedestal on top of two cross slides made of sturdy cast iron. All this is mounted on a bearing housing for a separate angular movement. The master template is fixed to the back of the colletand is supported by a revolving base. Separate templates are supplied for different shapes. The machine is fixed with the light attachment and a control panel, which contains the various electrical switches and a pilot lamp. The machine is fixed with coolant splash guards and coolant re-circulation system. The Gemstone is fixed on to a metal (brass/iron) dopstick with the help of a two compound epoxy glue. Dopstick is heated for glue to settle and fix the stone. The dop stick with stone is then inserted into the collet in the facetor and locked. The electrical connections are so designed that as soon as the facetor is brought nearer the grinding lap, the facetor motor starts operating. Stone is then ground on the grinding lap in accordance with the shape of the template used. The motors help in rotating the grinding laps, the work piece, the master template for the shape etc. Loading and un-loading of the stone and the angular movement are to be done manually. Setting the correct desired size of the stone – calibration. All stones operated on this setting will produce same size stones. Setting the height of the dome of the cabochon. This means that one can make cabochons of different dome heights with the same master template.The machine is ideal for shaping and calibrating gems in virtually any shape including cabochons. This machine makes cabochons on a standard 8″ dia-grinding lap as against the expensive variations used in other machines. This machine uses a two dimensional template as against expensive 3-dimensional templates used in other machines. This machine uses only one template for many different heights of domes of cabochons. Other machines need different templates for different dome heights. This machine doubles as a calibration and pre-shaping machine with minor adjustments that can be done by the user. This is a very user-friendly machine capable of many options all rolled into one package. 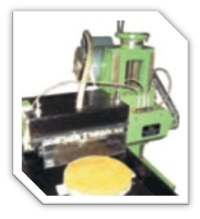 The grinding lap, dopsticks, dopstick stands, heater and glue are not provided with the machine.